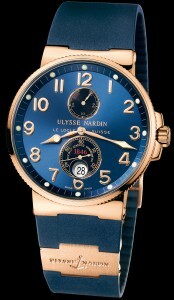 41mm, blue dial, 18k polished rose gold, with date, power reserve indicator, and automatic movement. The cities and dates when Ulysse Nardin received their 18 Gold metal are inscribed on the solid rose gold case back. Available on a matching blue rubber strap,and rose gold folding buckle.